Contents n n n Overview of the project. 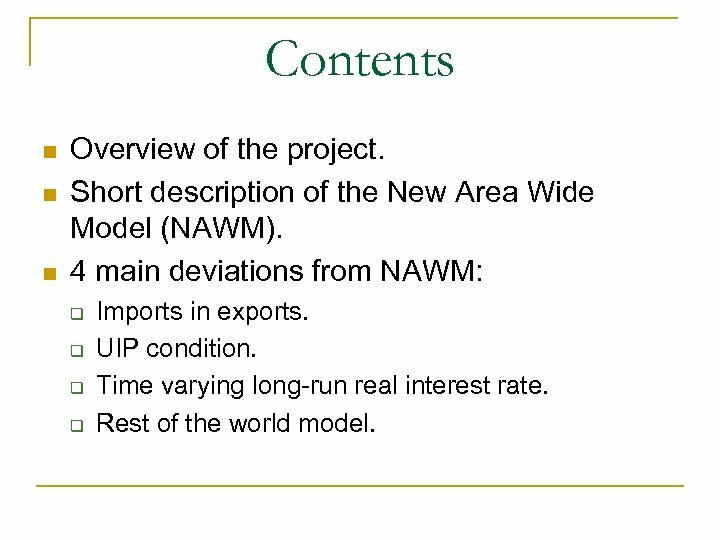 Short description of the New Area Wide Model (NAWM). 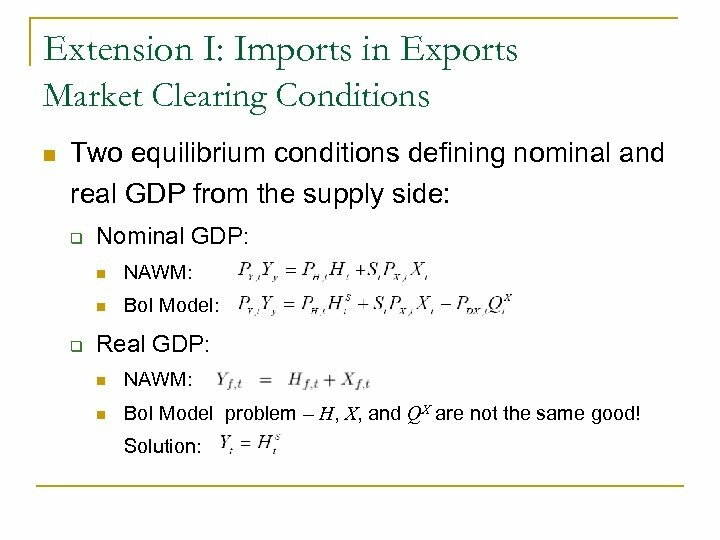 4 main deviations from NAWM: q q Imports in exports. 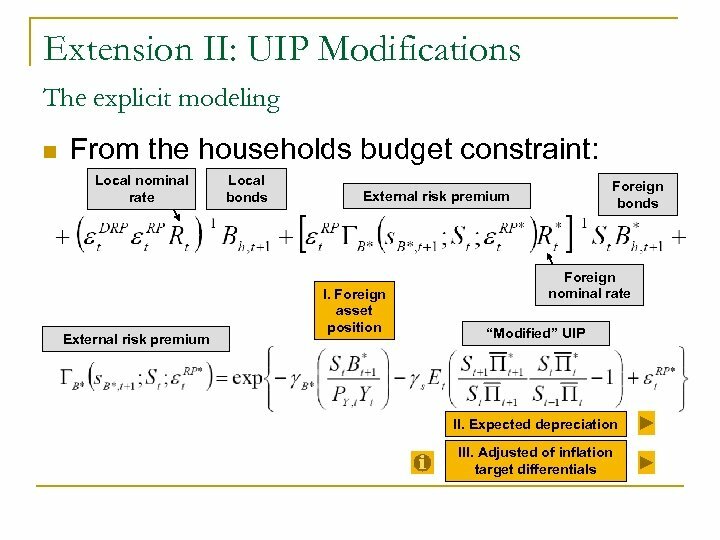 UIP condition. 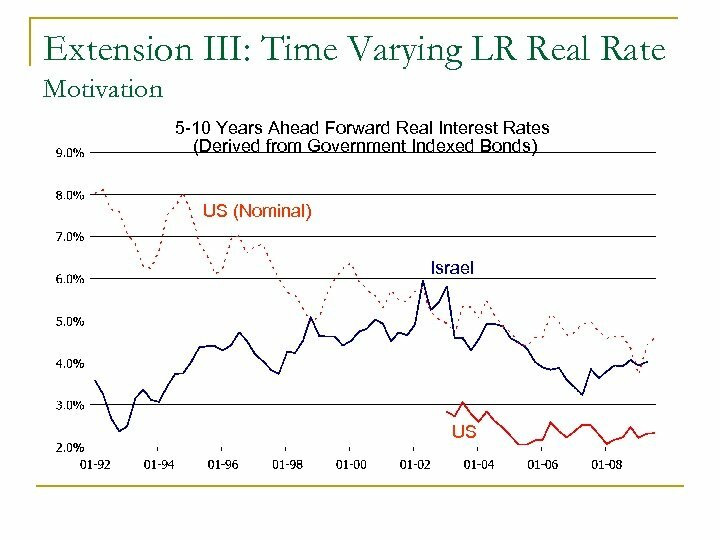 Time varying long-run real interest rate. Rest of the world model. 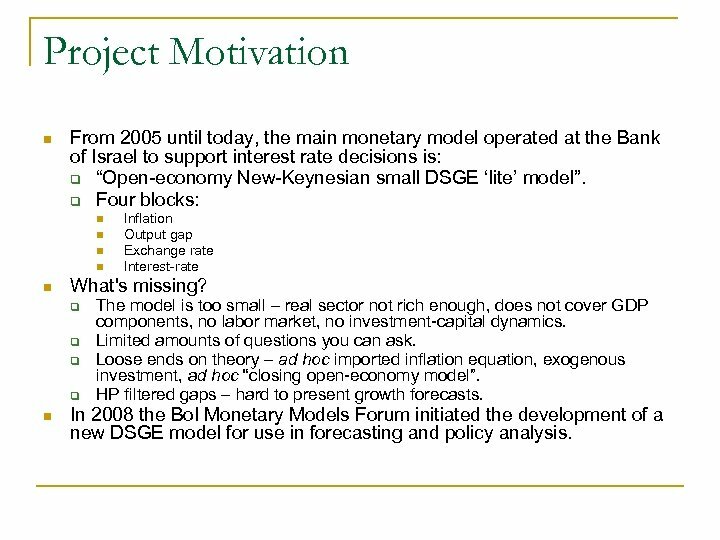 Project Motivation n From 2005 until today, the main monetary model operated at the Bank of Israel to support interest rate decisions is: q “Open-economy New-Keynesian small DSGE ‘lite’ model”. q Four blocks: n n n What's missing? 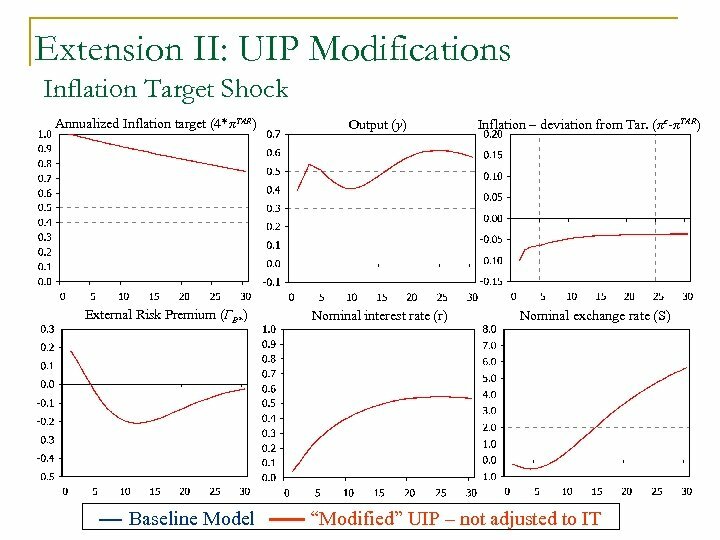 q q n Inflation Output gap Exchange rate Interest-rate The model is too small – real sector not rich enough, does not cover GDP components, no labor market, no investment-capital dynamics. Limited amounts of questions you can ask. 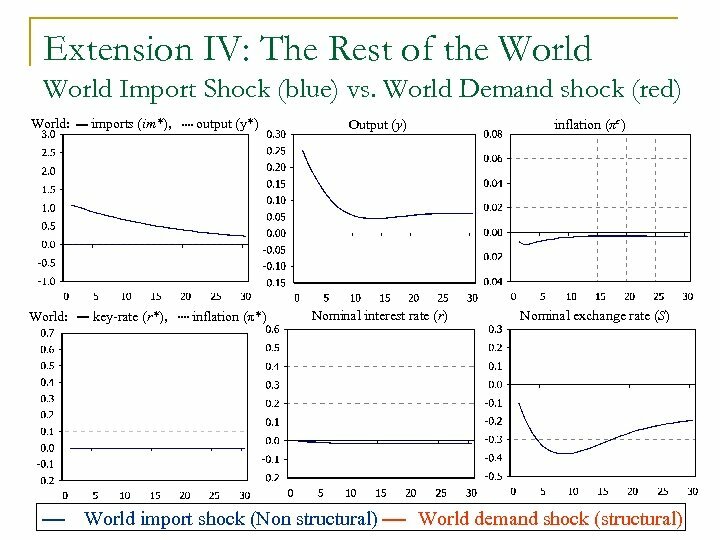 Loose ends on theory – ad hoc imported inflation equation, exogenous investment, ad hoc “closing open-economy model”. HP filtered gaps – hard to present growth forecasts. In 2008 the Bo. 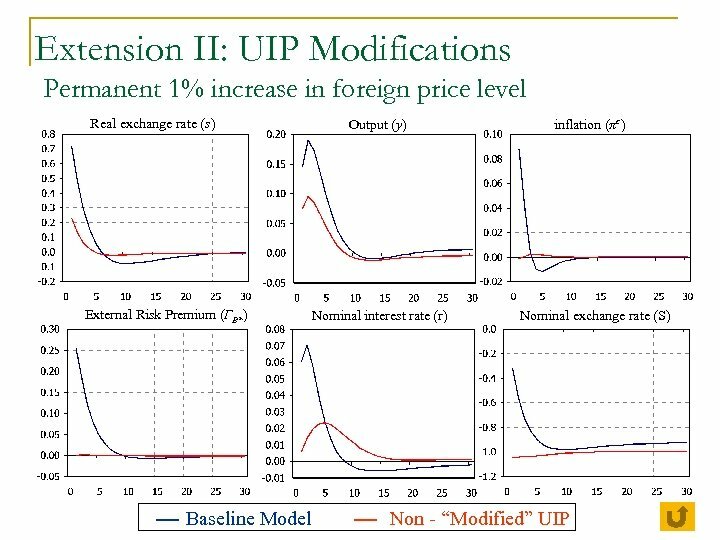 I Monetary Models Forum initiated the development of a new DSGE model for use in forecasting and policy analysis. 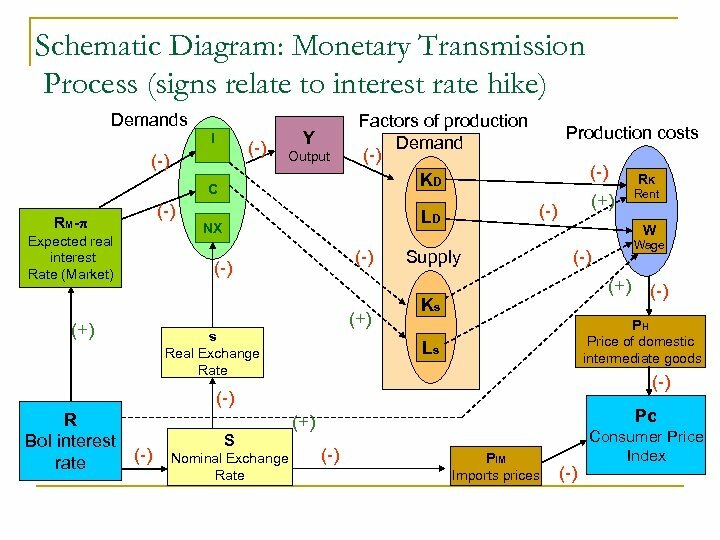 The Project n Starting point – ECB’s “New Area Wide Model” q n Similar (RAMSES, NEMO, TOTEM) Stages of the project: q q q Study and replicate the NAWM – done. 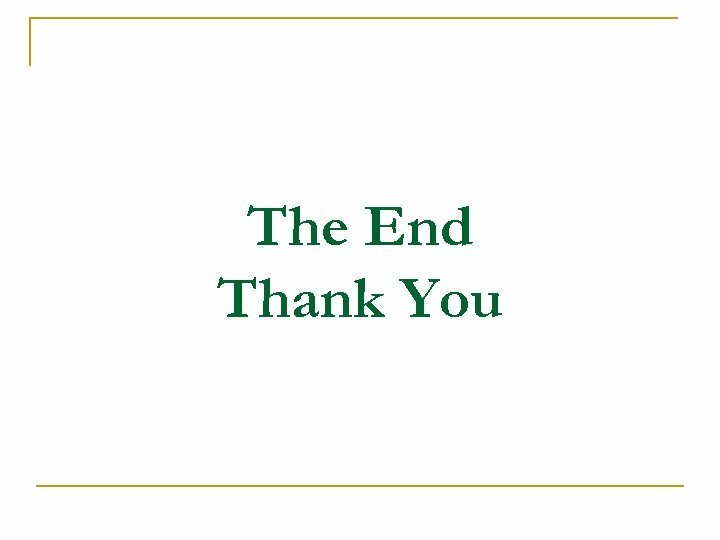 Derive analytical solution to steady state – done. Calibrate version for Israel – done. 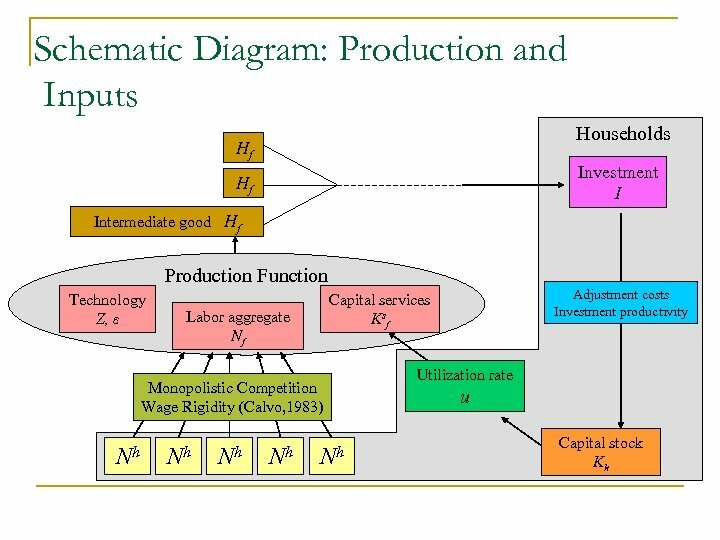 Implementing the model for practical use – ongoing Bayesian estimation of the model – ongoing Extensions of the model – future work n n n Financial frictions Search and matching labor market Distinction of business sector vs. government output. The New Area Wide Model (Christoffel et al. 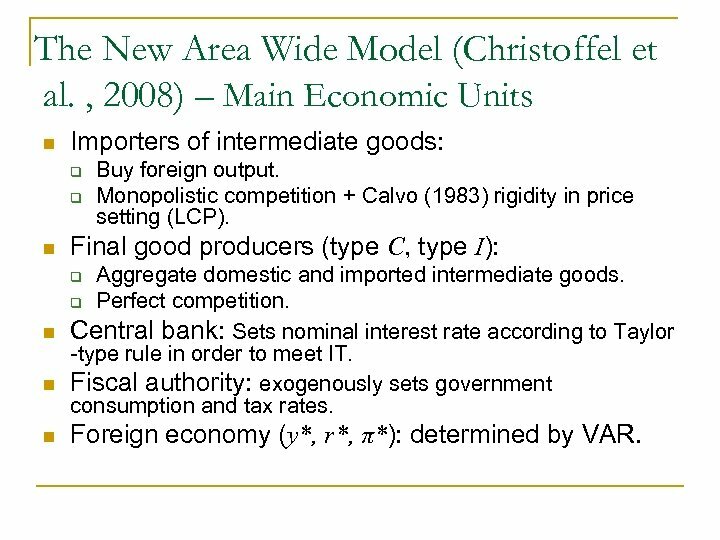 , 2008) – Main Economic Units n Importers of intermediate goods: q q Buy foreign output. 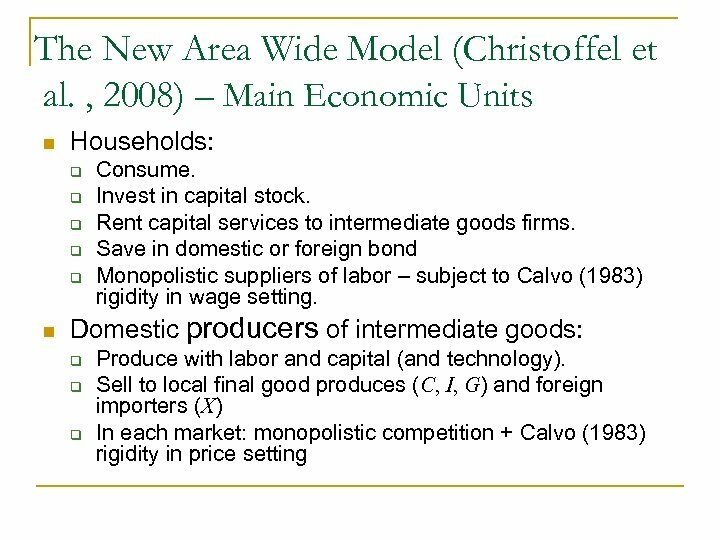 Monopolistic competition + Calvo (1983) rigidity in price setting (LCP). 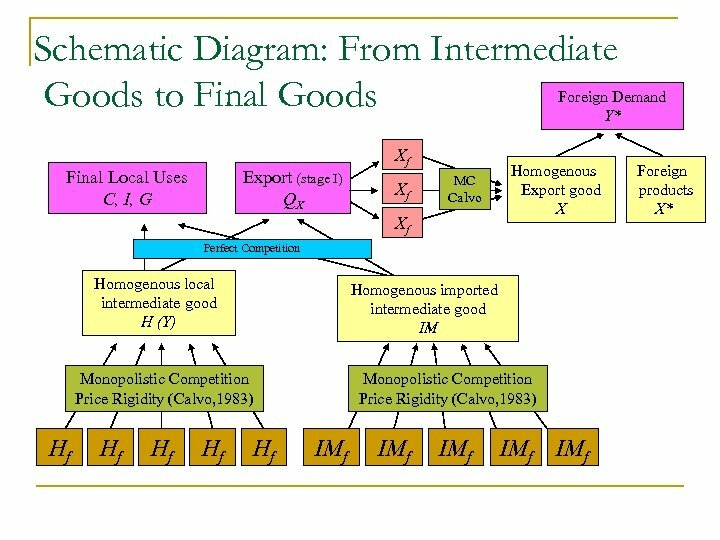 n Final good producers (type C, type I): n Aggregate domestic and imported intermediate goods. q Perfect competition. 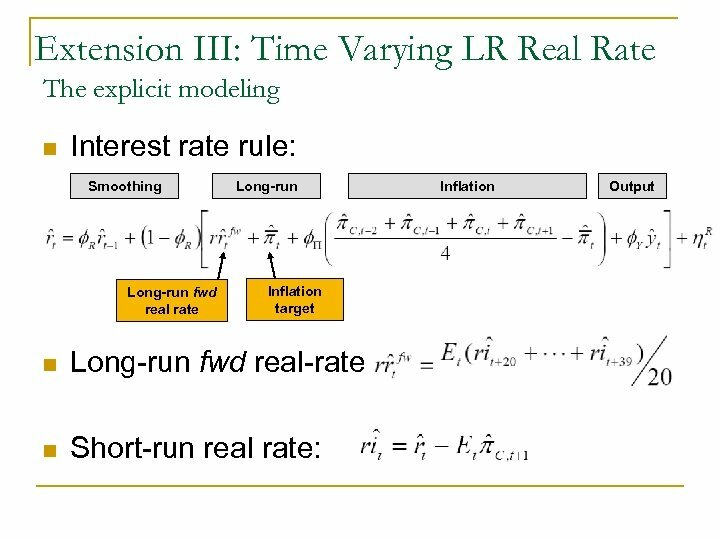 Central bank: Sets nominal interest rate according to Taylor -type rule in order to meet IT. Fiscal authority: exogenously sets government consumption and tax rates. 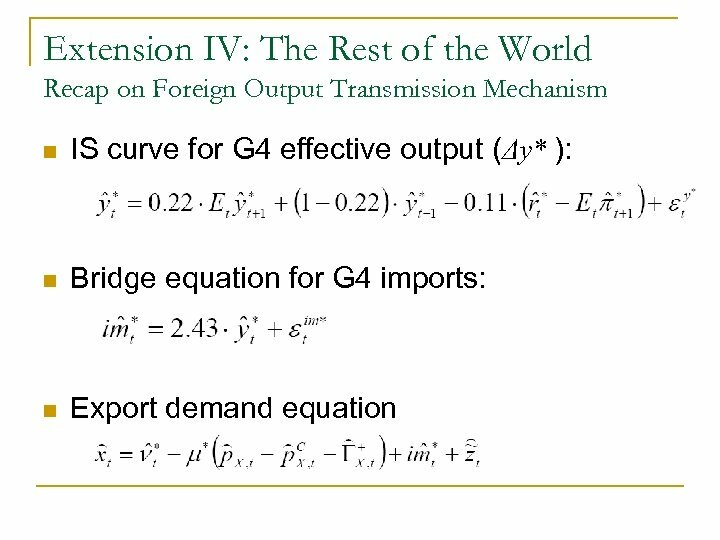 q n n Foreign economy (y*, r*, π*): determined by VAR. 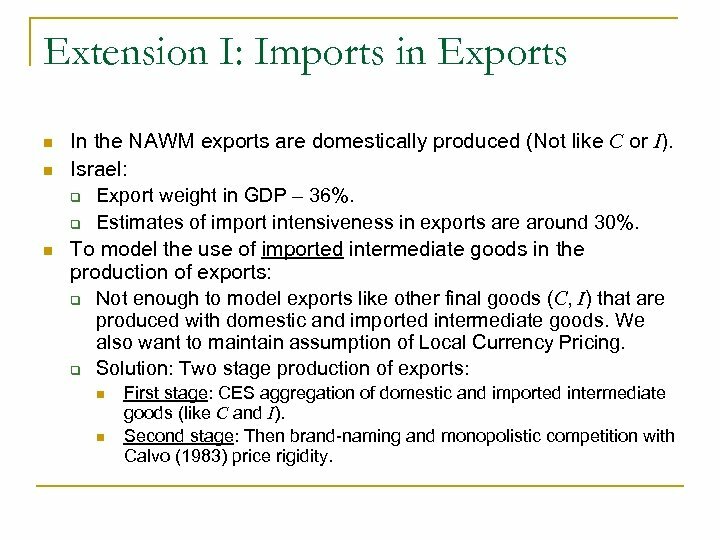 Extension I: Imports in Exports n n n In the NAWM exports are domestically produced (Not like C or I). 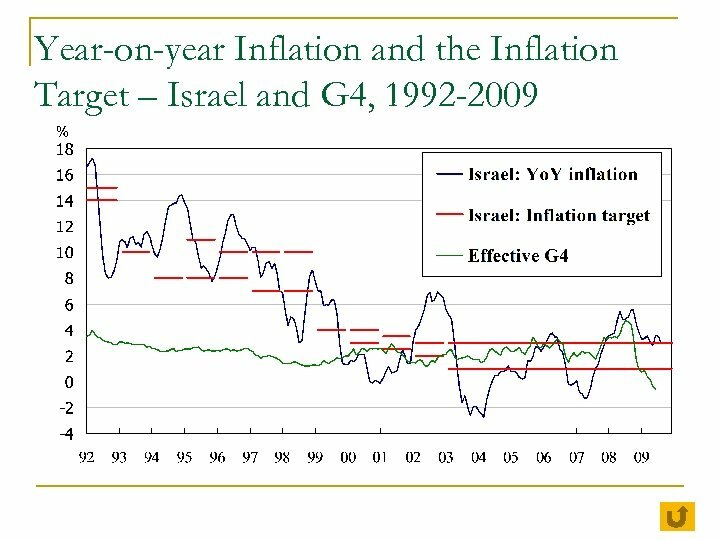 Israel: q Export weight in GDP – 36%. 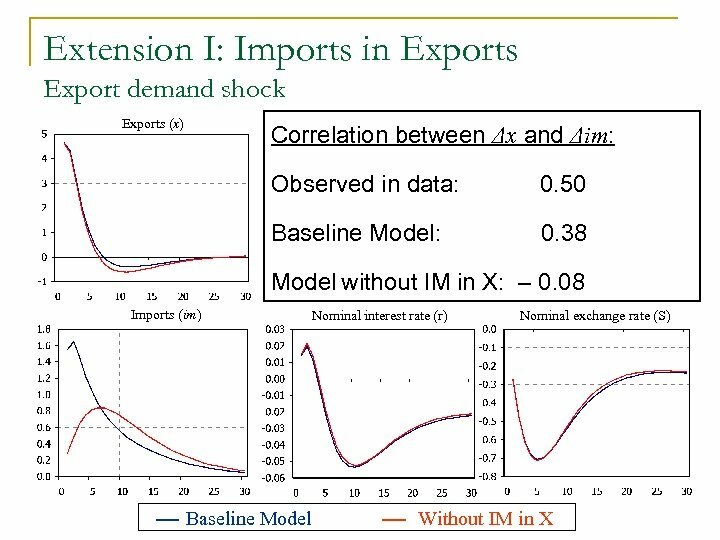 q Estimates of import intensiveness in exports are around 30%. 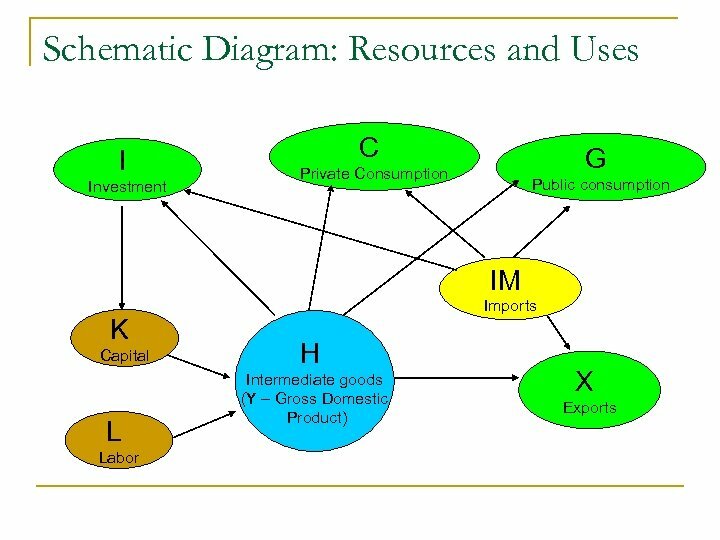 To model the use of imported intermediate goods in the production of exports: q Not enough to model exports like other final goods (C, I) that are produced with domestic and imported intermediate goods. We also want to maintain assumption of Local Currency Pricing. 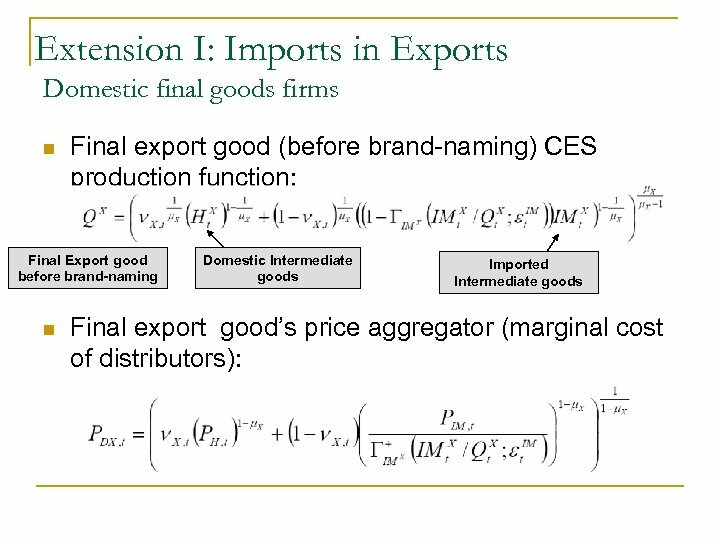 q Solution: Two stage production of exports: n n First stage: CES aggregation of domestic and imported intermediate goods (like C and I). Second stage: Then brand-naming and monopolistic competition with Calvo (1983) price rigidity. Extension I: Imports in Exports Exporters n n n Domestic monopolistic exporting firms buy the homogenous export good ( ) at constant marginal cost – Differentiate it using a simple production function: Sell it abroad at a marked-up price, , to foreign retail firms. 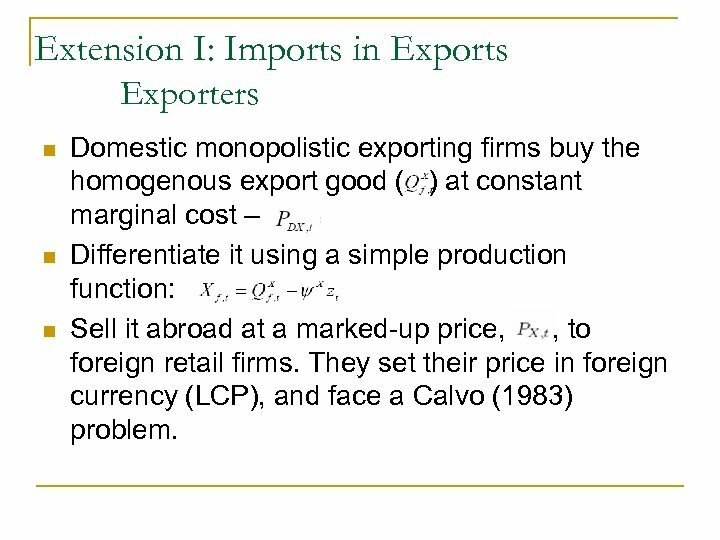 They set their price in foreign currency (LCP), and face a Calvo (1983) problem. 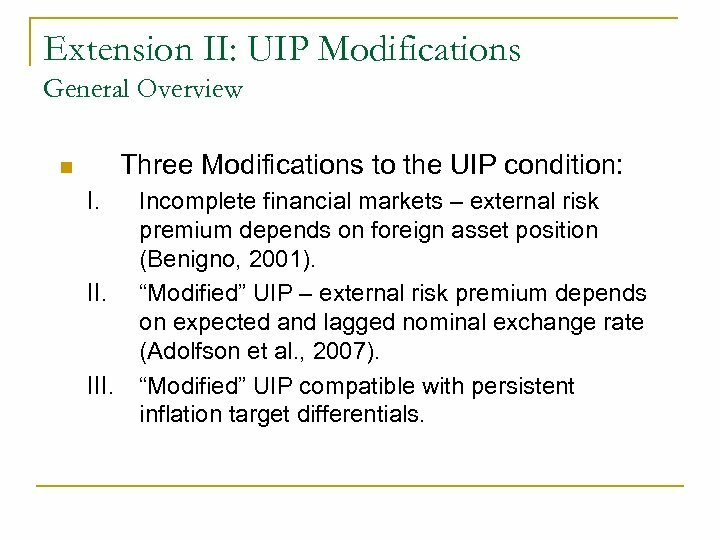 Extension II: UIP Modifications General Overview Three Modifications to the UIP condition: n I. III. 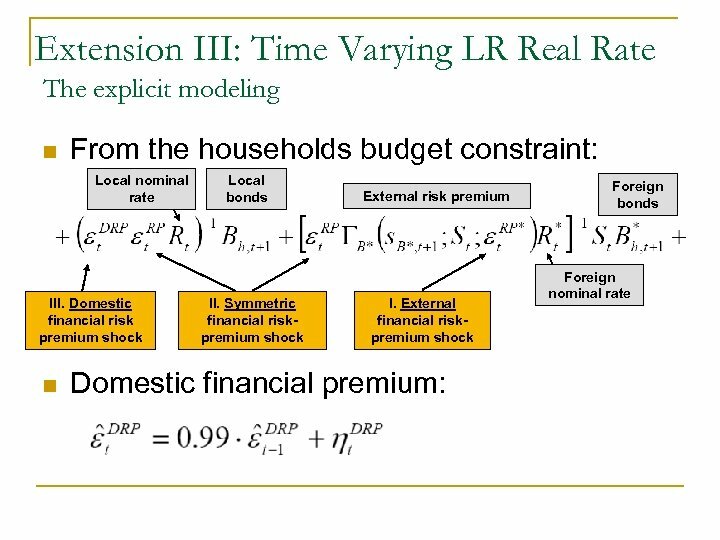 Incomplete financial markets – external risk premium depends on foreign asset position (Benigno, 2001). 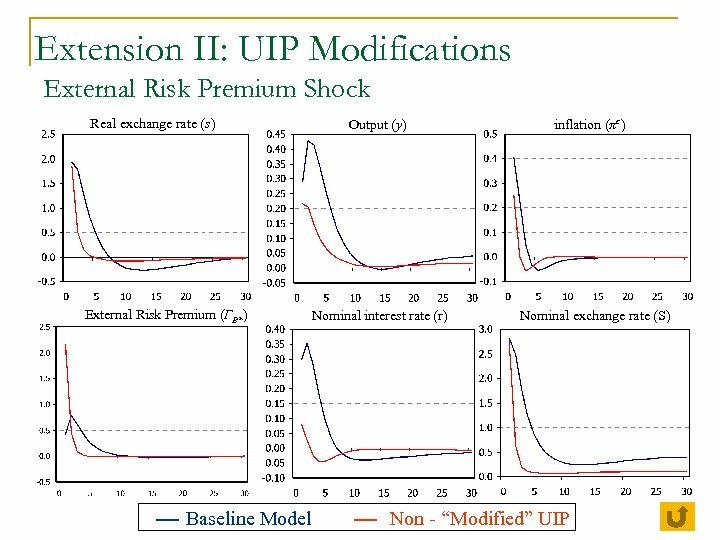 “Modified” UIP – external risk premium depends on expected and lagged nominal exchange rate (Adolfson et al. , 2007). 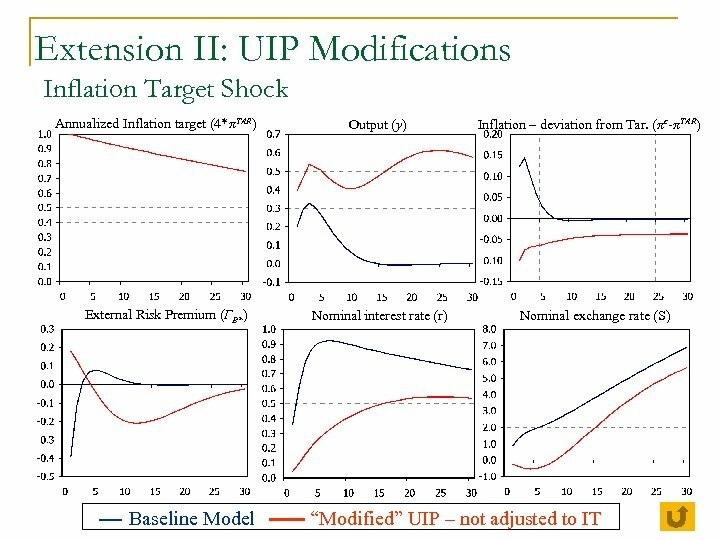 “Modified” UIP compatible with persistent inflation target differentials. 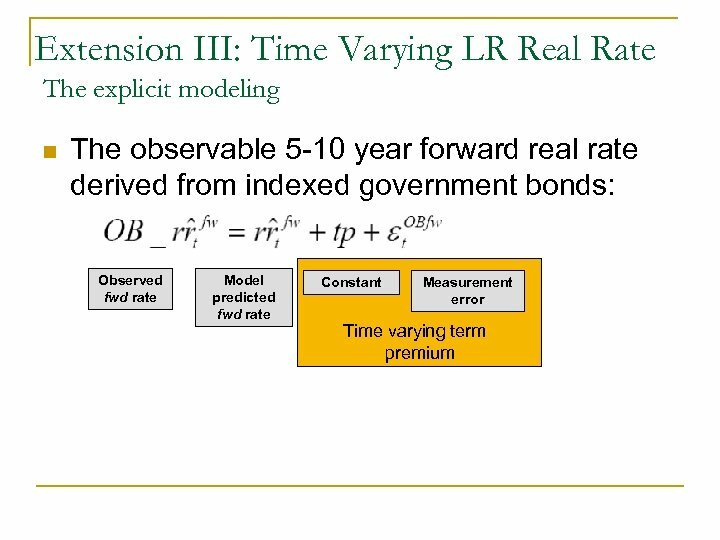 Extension III: Time Varying LR Real Rate n We add to the model: q q q Financial shock and structure that allow expected long-run (5 to 10 years) interest rates to change over time. 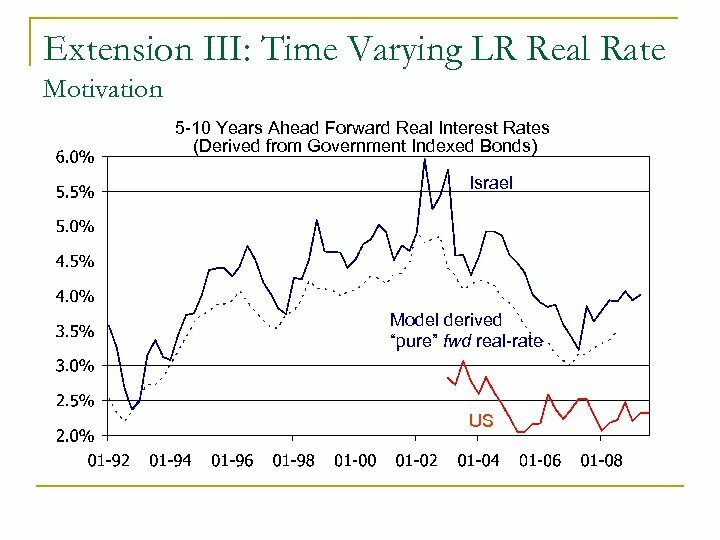 Monetary policy uses long-run interest rates (forward 5 to 10 years ahead) as benchmark rates. 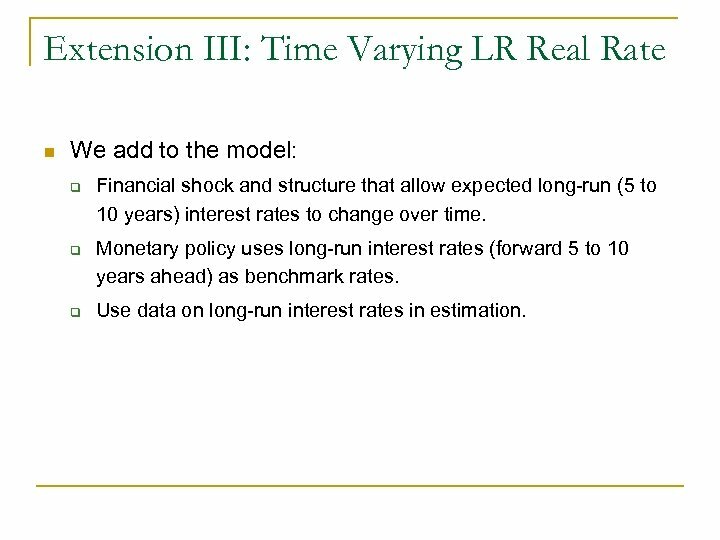 Use data on long-run interest rates in estimation. 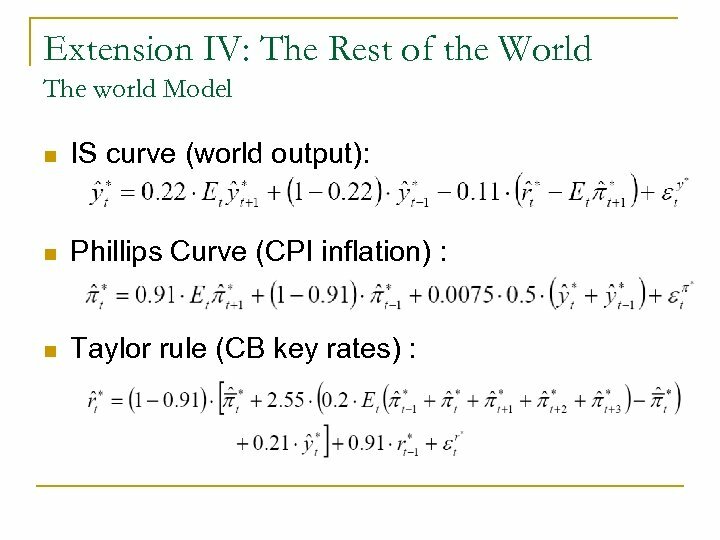 Extension IV: The Rest of the World Options at Hand n How to model the rest of the world (i*, π*, y*)? q q q Single-equation AR. 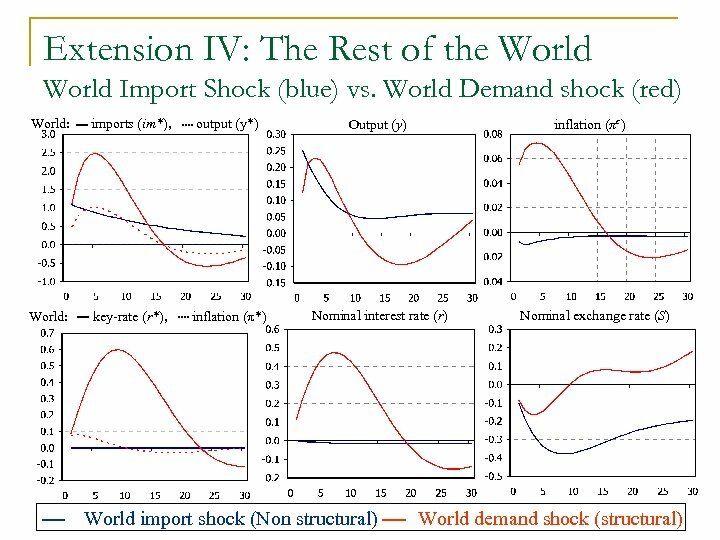 Problem: can’t apply structural foreign shocks. VAR (example - NAWM). Problem: “Well” looking structural shocks depend on identification assumption. 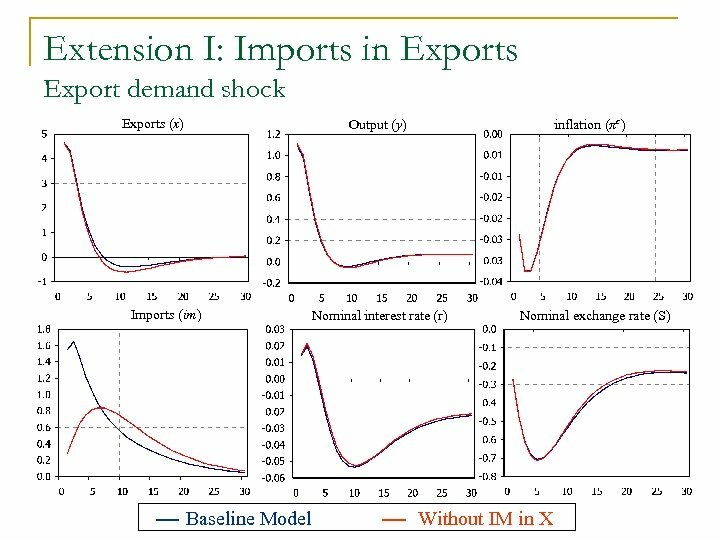 Closed economy NK small model. 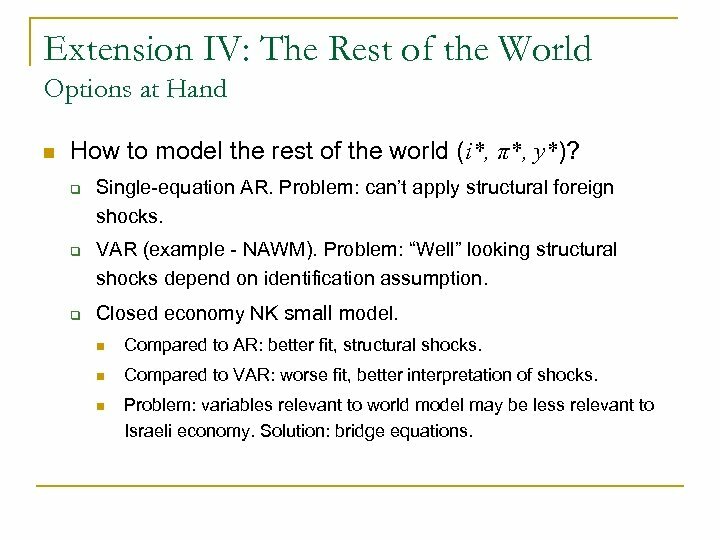 n Compared to AR: better fit, structural shocks. n Compared to VAR: worse fit, better interpretation of shocks. 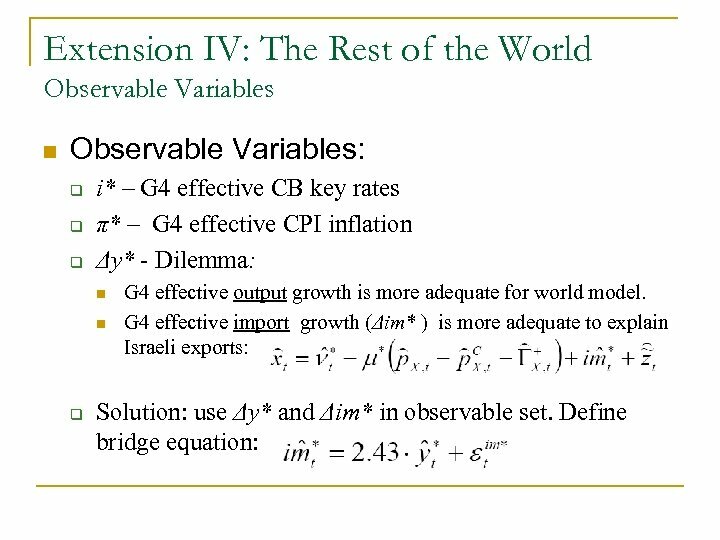 n Problem: variables relevant to world model may be less relevant to Israeli economy. Solution: bridge equations.